All Breeding programs start somewhere and ours is no exception. 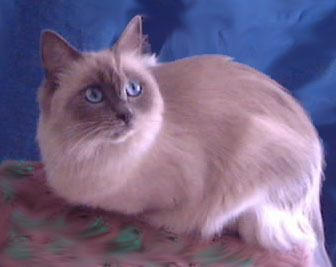 We started with one gorgeous Blue Point Ragdoll girl, Cottonwood Tri Majik - Stumpy to her friends. Stumpy is retired from breeding and is desexed and still living with us as a cherished member of our family. She will stay with us forever as she and I have a very special relationship. 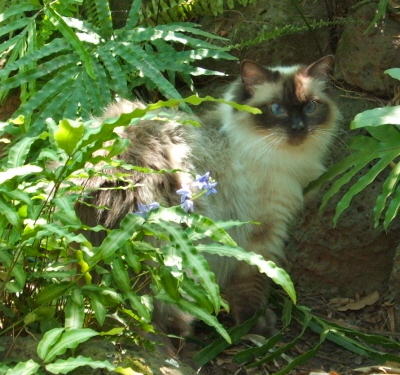 Our first litter ended up with all seal point girls, of which, we retained one to go on with. She is called Ch Furrballz Seal of Love, or Pip to her friends. 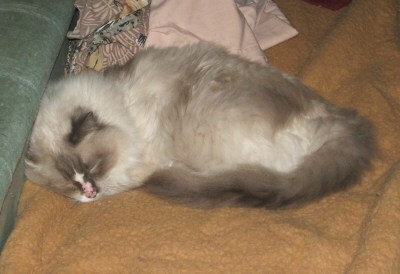 Pip is also desexed and retired fom breeding and is a loved pet of Lyndsay. Our first Stud was a lovely Blue Mitt with Blaze boy called Ch. Kailuv Ina Flash. Sadly 'Flash' developed a mosquito allergy at an early age and couldnt stay a Stud for very long. He is the Sire of our wonderful promotional cat Ch PN Furrballz Batchelor Boy and is also retired and living with 2 of his sons (One of which is Batchelor Boy) with Liz and Simon...being pampered as they should be!